By the time I was ten years old I knew this life wasn’t for me. No, I was not molested. I was not beaten or abused in any way. I was the middle child in a large Orthodox family and I always felt loved and cared for. My parents are honest and kind, good people. But there was something in this life filled with rules and limits that I couldn’t understand, something that tugged at my heart and told me that my path would be different. And all this before any Jew would disappoint and disgust me and lead my intellectual self running toward the place my heart had been taking me to. I was fourteen at the time. I was hanging out with whomever I wanted. I was eating whatever I wanted. But I was in an Orthodox school and environment and my friends were, as well. I wasn’t doing drugs. I wasn’t staying out late with a bad crowd and partying. I was living the life I knew was right for me. My friend Leah was rebellious. She knew she was would always be frum, but the pull of my attractive life had her acting out and doing stupid things. She was looking for answers and wanted help, so when someone suggested she speak to Rabbi Ezriel Tauber, she did. She liked him and found that his approach worked for her. Maybe she just wanted some extra attention and validation of what she already believed. In any case, she harassed me into going to see him. I did, just to make her stop. And then my whole life changed. My view of Jews and Rabbis became warped. He was the first of many to show themselves for who they really are – wolves in sheep’s clothing. 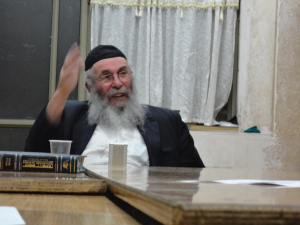 It was a chilly night and Rabbi Tauber’s small office was warm and cozy. I thought to myself, “This will be quick and easy”. Oh boy, was I wrong! So painfully wrong. The Rabbi told me that my soul wanted to be better than I was. That I was giving in to animalistic cravings and I had to stop. I told him I didn’t agree with him and liked where I was in my life. When he asked if I was involved with a guy, I was honest and said yes. Then he asked for the boy’s phone number. I was immediately suspicious and said I didn’t want to share that with him. Why did he want the number? The Rabbi said he just wanted to talk to my friend and see what kind of guy he was. I was curious. I wanted to know what he would say and how my friend would respond. So I gave him the number. The Rabbi dialed the number while I sat there, totally trusting him at his word. And then he blew my naive world apart. He told my friend that I had come to him for help. That I wanted to break up with him but didn’t have the courage to do it myself. He said I wanted to be a better Jew and wanted nothing to do with my boys anymore. Consider the relationship over. Rabbis don’t lie! Rabbis are trustworthy! How could this have happened?! But it had. I left Rabbi Tauber’s office with an open wound that night. Over the years salt has been poured on my wounds and they have been reopened wide, time and time again. The further away I travel from that world, the easier it is for me to breath. The air over here is clear. I also had a bad insident w rabbi tauber. At fourteen you probably were too young to be in a relationship with a boy anyway. But “Rabbi” Tauber did betray your trust, and you were right to go OTD.